Twilight of the dark master is a gloomy and gruesome tale of demonic woe. Gore, neo-Tokyo landscapes, darkness, overpowered humans and clich�d characters abound, making this journey interesting but nothing new or amazing to watch. In comparison to some of the overly gory nonsense that has been released on Manga in the last 10 years, the level of gore in this film is quite reasonable. Dismembered limbs and shadowy broken bodies are pretty much all that we are subjected to in this film. This is a good thing, as the gore is shown to illustrate a point, rather than being a point in itself. I take this as a positive sign that the director is going somewhere deliberately with the DVD, rather than just filling in time. Pretty much the first thing I noticed about this DVD was that the animation is dated. This is apparent in several areas, the foremost of them being the fuzziness of the backgrounds and the lack of detail on the characters. If you can put this aside and take into consideration that this was made in 1997, it's not too bad. The tale in this feature centres around four main characters; Eiji, Shizuka, Tsunami and Takomiya. Eiji and Shizuka are a pair of lovers separated when Eiji becomes a demon and rips off Shizuka's arm. Shizuka goes and replaces her arm, and then in her shock from the event, walks into a place called neo-shinjuku and in the process of nearly being killed, is saved by Tsunami's henchman, Tenku. Tsunami is the all powerful good guy in this film, with god like powers of flight and the ability to send out insane firestrikes. He was also the one that razed Shinjuku 30 years prior in his battle with his arch enemy Takomiya. (Tsunami is also the Japanese term for the massively destructive waves created by hurricanes). 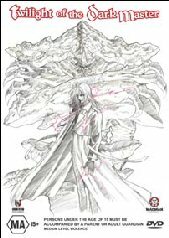 Takomiya engineered the creation of the demon Eiji, in order to drain his blood, and then he can regain his true demon form. A few interesting fight scenes ensue, lackey die, and then finally Takomiya regains his true form. In the same manner as the fight scene between Mr smith and Mr Anderson in Matrix Revolutions, the two fight a few kilometers above the earth in front of a very large moon. This scene is really good to look at, Tsunami is dwarfed by the impressively massive demon. It is here that we find out that Takomiya is actually female (but who can really be sure with these demon types). She then dares Tsunami to release his full power, but instead he teleports them both to what looks like the far side of the moon and then destroys the demon. All in all a nice little journey, nothing brilliant, but definitely better than your average fare. 4:3 frame ratio. This is a very dark feature, and in some places you will need to adjust yours screens brightness if necessary. As mentioned before the animation is dated, especially the demons, they are quite 80s. Japanese 2.0 with English subtitles. The Japanese translation into English words is good, and the selection of voices used to dub for the English version is brilliant. However if you listen closely to the English words, they are significantly different to the subtitles given. This is very disappointing as both versions make sense, but its one of those glaring oversights that really brings this DVD down. A very very cool black and white pencil sketch adorns this cover. Bonus points for this one. -Creating the cover: a line by line mini feature that shows how all the shading and line work was done for the cover. -Art gallery: a good synopsis of the main protagonists -Madman propaganda: Scryed, Big O, L/R, Beserk, Bio Hunter, Golgo, 13 Queen bee, Psycho diver.